Exactly 365 days after its release, the Ultra Boost changed the game for adidas. Here's how. A year ago today, adidas introduced a new sneaker, the Ultra Boost, that would change the climate of the company’s sneaker game for the next year. Making a bold claim that they were launching the best running sneaker ever, the Boost technology already had people intrigued. The design, however, was a major upgrade from previous Boost runners in the same family tree, so it didn’t seem like too much of a reach for the brand to make this declaration. Boost has been around since 2013; it was first created in a laboratory by BASF and started as a technical tool for runners looking for the ultimate ride, while trying to knock out steps for their Fitbits. In 2014, the adidas Energy Boost 2 gave the original model to use the technology even more comfort and also upgraded the aesthetics so you could actually wear them outside of the gym. Boost started showing up in more sneakers, including the Derrick Rose signature line, proving that it was useful for more than just running—and that it was the future of the brand. As it turns out, the adidas Ultra Boost truly was on another level. I was fortunate enough to get a pair of the lead colorway—in black and purple—from adidas during NYC All-Star Week last year. I can’t front: After wearing the Energy Boost 2 non-stop in 2014 and knowing there was additional Boost added to the Ultra, I knew this sneaker was going to be a must. As an average sneaker consumer, I probably would have waited until someone gave me a good deal instead of paying the full $180. People were speaking the gospel on the comfort of the Ultra Boost, but I was still hesitant to get a pair. Adidas just needed the right color and the right moment for them to take off. It didn’t take long before Kanye got his hands on the Ultra Boost during New York Fashion Week, and the sneaker started to pick up some momentum. Yeezy sporting the all-white Ultra Boosts and image of him flying across the stage at a Powerhouse 106 concert in Los Angeles was the hero shot the brand had been waiting for. The image went viral and retailers cashed in on the co-sign. Early adopters were annoyed by the hyperbole, but it was all part of the master plan: Get the most influential style icon signed to your brand photographed wearing your key releases, and watch the money pile up. As Jon Wexler, the Global Director of Entertainment and Influencer Marketing at adidas, has stated in various interviews—​and Kanye has in one of his greatest songs: You can’t really tell him nothin’. Meaning, there was no deal to get him to wear X, Y, and Z before he debuted his own shoes. It was all organic. Just as much as Kanye wore his own signature sneakers with adidas, he also favored a running shoe that has had just as much impact in the industry as his own Yeezy Boost. And what kicked off as a game-changing running shoe turned into the hottest lifestyle look in the streets. Whether that was ever the intention or not, adidas’ plans to seems to have worked out just fine. Adidas really needed a sneaker that was capable of looking as dope with an over-sized crewneck and jeans as much as it would with head-to-toe Climacool workout gear. Endless Instagram accounts dedicated to what to wear with the Boost were created, taking outfit grids to another level with minimalistic on-body style shots. People did their best to cook up custom pairs with yet-to-be-released colored Boost soles to one-up their peers, and top retailers and designers created their own takes on the sneaker. 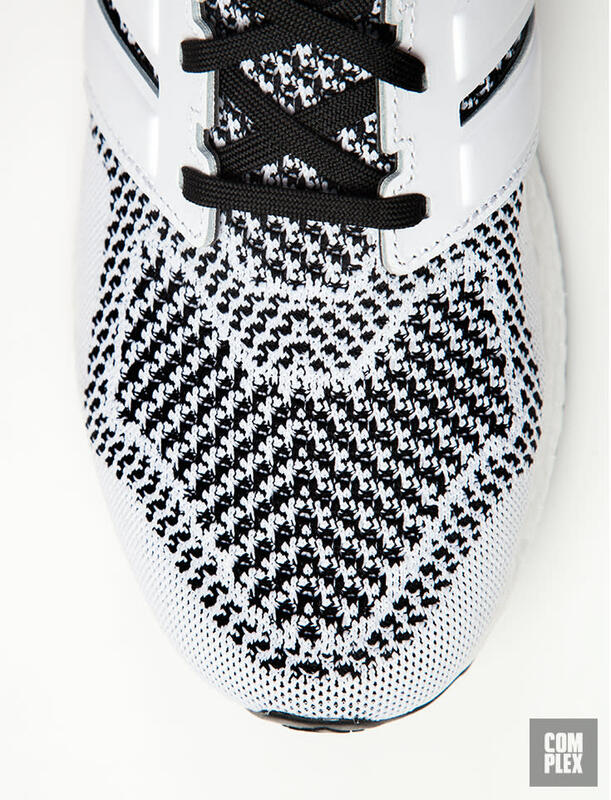 Folks were cutting the adidas Three Stripes off the shoe, which came in plastic form, to “Uncage” the Ultra Boost. Adidas ended up doing just that on a collaboration with lifestyle blog Hypebeast for one of the best versions of the greatest “running” shoe, ever. It was clear that the sneaker had surpassed celebrity influence and had become something of a cult classic success, much like Nike had done with the Roshe Run had a few years back. It’s been a minute since adidas has had a non-limited sneaker that steadily sells out every time it’s in stock and, on top of that, commands reseller prices. For a while the all-white Ultra Boost was selling at double the MSRP on eBay and, even almost a year later, the white shoe still sells out as soon as they hit sites after being “restocked” two or three times. The success has even carried over to other neutral options, even at $180 which, is considered a premium for inline casual shoes. There were even premium versions designed by adidas execs James Carnes and Dirk Schonberger. And while some brands shoot themselves in the foot by trying to repeat success without being innovative, adidas has taken the blueprint from the Ultra Boost and applied to a handful of new and, most importantly, fresh looks to keep the momentum going. Just peep the buzz around the NMD, Pure Boost X, and recently unveiled Futurecraft Tailored Fibre. It’s not hard to tell that a few other brands are going to be playing catch-up in 2016. The Yeezy Boost may have won the Footwear News award for Best Sneaker of 2015—​for the record, Complex ranked the Ultra Boost as the no.1 sneaker of the past year—​but the Ultra Boost had the biggest impact for the brand. It pushed major units and gave adidas it’s biggest crossover hit since, well, it’s been a while. The best part about the sneaker is you don’t have to run off on the plug to get your hands on a pair. That’s the way sneakers were intended to be, and even the way Kanye envisioned his own line. And Between the Boost technology and superior Primeknit upper, it is the best running shoe turned lifestyle phenomenon since Nike introduced the Flyknit Racer at the 2012 Olympics. Here we are a year later—​adidas didn’t oversaturate shelves with a million colorways and variations; the brand kept it simple and clean, and gave people the essentials to keep in their sneaker rotations. Even once it got big, adidas didn’t overthink the Ultra Boost or try to force something on consumers by marketing a product people didn’t want. It really had nothing to do with the original marketing concepts or press kits, the success of the Boost was just life dictating the trend’s direction. You can have all the dope lookbooks, influencers, and paid content you want, but, at the end of the day, you simply need a hot product—​and adidas gave everyone just that.